Is surrender God’s gift to us or some type of hoax for those who are weak? For those of us that want answers in prayer, it seems that surrendering to God’s will is not something we can do easily. This is something that takes more than a passing faith. People are in different stages of their faith journey and surrender takes maturity. Thanks to our sponsor, Media Angels, Inc. the publisher of the book, A Few Minutes with God. Purchase the book or eBook on Amazon. Surrender means trust and it means our faith is at that next level of complete and unapologetic understanding that God knows best. I remember a faithful nun who had built a television network of religious broadcasts all while she was a cloistered nun. She received special permission to enter the world outside of her convent while she did the Lord’s will. The most amazing aspect of this situation other than the very successful network EWTN (Eternal Word Television Network) was the fact that this nun was crippled in her walk. The Lord had healed her as a young lady of a crippling disease, only later in life for her to have another ailment. When people questioned her faith or the fact that if she had “more faith” she could ask God to heal her, she said and believed that this was God’s will for her at this time. She had indeed surrendered her life to God. Later on, in her old age, the Lord did heal her completely and it was for another undertaking, that of building a much larger church for which she traveled home and abroad to find the perfect pieces for this church which was totally financed by the donations of five wealthy families. She, Mother Angelica was a perfect example of what it meant to surrender and she did it with humor on her weekly telecasts. Friends this is grace that is given to each one of us by God. This is the grace to surrender to our circumstances and situations which is such an example to believers and unbelievers at the same time! The reason surrender is a gift to us is because allowing ourselves to give the giver means we can never outgive. Think about it. God gives us everything. Our very breath, our lives, our essence. And by giving God your free will – in essence, the gift you cherish the most, you are gifting God a beautiful part of who you are! This should be a huge sign that resides on the wall of each and every home! Why is surrender God’s gift to us? Yet it is difficult to surrender. We must surrender more than just our mind – it is a total surrender of heart body and soul! We can be reconciled to God by the saving grace of the life, death, and resurrection of our Lord Jesus Christ. We can’t surrender just one part of us – we must surrender all that we have. This happens over time by studying the Bible, spending time in prayer with God, journaling and listening to the Lord. Living in this world we are separated from God. We will not be fully united until we die in a state that allows, by the grace of God for us to enter heaven and be in a full union with Him the epitome of total surrender. In this world we are limited and yet we can accomplish much through Christ that strengthens us. If I have the gift of prophecy and know all mysteries and all knowledge; and if I have all faith, so as to remove mountains, but do not have love, I am nothing. And if I give all my possessions to feed the poor, and if I surrender my body to be burned, but do not have love, it profits me nothing. 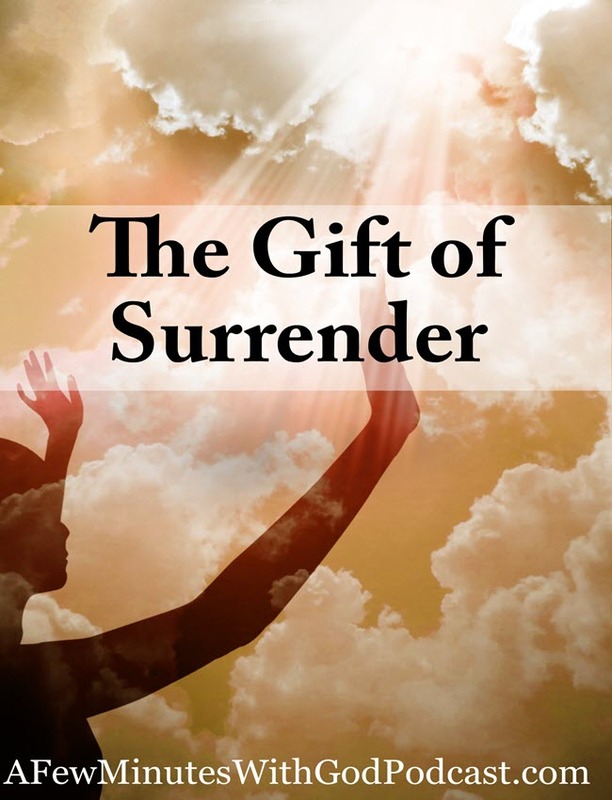 Surrender is a gift from God – it is the ultimate gift we can give to God as well. Can you say yes to the Lord, I surrender to you Lord no matter what your situation in life? Dear Lord only by spending time with you in prayer, in the study of Your Word in the Holy Scriptures, in the ability to understand your wisdom for our lives – only then can we learn to surrender. Lord, I give you my heart, my body and my soul, Lord I give you all of me not just part. I pray that you open my heart to understanding more of the Word as I read it, allow me to hear your small still voice in the Holy Scriptures, send me people who love you and will affirm and encourage me to dig deeper and learn more and give more of myself to you. I praise you and I thank you for all you have done for me and my life – and I pray for those in need of prayer … and I ask that you comfort them, and I pray this in Jesus’ Name. Amen.